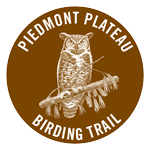 The Piedmont Plateau Birding Trail in East Central Alabama has 34 sites, from Alabama’s highest mountain to the shores of Lake Martin, the state’s first Treasured Alabama Lake. The bird habitat found here is as varied as the scenery. From a paved walking trail in the middle of a city park to an adventurous float down a scenic river, you’ll find an activity that fits your interest. Mount Cheaha is Alabama’s highest point, and it is one of the southernmost locations to find a number of the state’s more interesting breeding birds, such as Blue-headed Vireos, Cedar Waxwings, and Sharp-shinned Hawks. Additionally, Cheaha State Park is located in the middle of the Talladega National Forest. Cherokee Ridge has 11 miles of hiking trails, with one skirting the shoreline of Lake Martin for approximately 4 miles. Other areas of the trails are high rocky ridges and bluffs, some with vistas of six to eight miles overlooking Kowaliga Bay and Chimney Rock. Bald Eagles are regularly spotted over the lake; Wild Turkeys are abundant in the lush hardwood forests that surround the trail, as are other traditional woodland birds. The Clay County Public Fishing Lakes are attractive and open, with waders and Wood Ducks present year-round. Expect waterfowl in winter; look for Ospreys and Bald Eagles over the lakes all year. Fields near the entrance have Northern Bobwhites, Eastern Meadowlarks, Indigo Buntings, Blue Grosbeaks, and Red-tailed Hawks. All-age woods around the lakes abound with songbirds. Look for swallows and Purple Martins over the water. Confederate Memorial Park is a little-known jewel. The upper portion of the park features open understory and mature canopy trees — outstanding for flycatchers, woodpeckers, bluebirds, warblers, and vireos. The cemetery area affords open views of sky for soaring birds. Walk the nature trail; it is bird-rich. The area near the cistern is an outstanding location for Swainson’s Warblers and Acadian Flycatchers.